More than ever, the world needs activists making sure their voices are being heard. At SignUp.com, we believe that when people get together, great things happen. 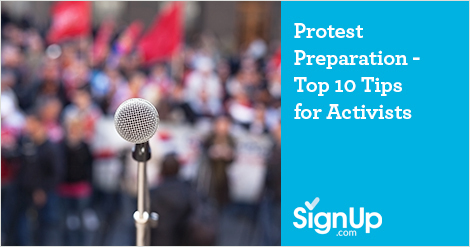 If you feel moved to join a protest or a rally, here are some helpful things to do and to avoid. 1. Check the weather forecast. Be prepared for the anticipated weather—apply sunscreen or tuck in some plastic bags to keep your cell phone and wallet dry. 2. Make signs. These don’t have to be super-elaborate; permanent marker on poster board is works great. (Permanent marker is a good idea in case of rain.) Be concise and legible and avoid profanity. 4. Make a plan with your posse. Cell service is often spotty in large groups of people so make a plan in advance with the people you’re going with so you know where to meet at what time. Make sure that you tell the plan to someone who isn’t going who can follow-up to make sure everyone is safe and accounted for after the event. 5. Plan your transportation ahead of time. Parking close to the event will probably be limited, and public transportation will likely be rerouted if it’s a large gathering, so finalize your details ahead of time. Explore whether shuttle buses are being arranged from outlying parking lots, or arrange for a rideshare car service to pick you up at a specific spot. 6. Bring your kids. It’s never too young for kids to see their parents get excited and involved. Just remember that most rallies and protests aren’t geared toward children, so bring strollers, snacks, and something to do for the littlest activists. 7. Write an emergency contact number on your body in permanent marker. You’ll probably never need it, but it’s good to take the precaution in case you have a medical emergency or are detained and your cell phone is taken away. If you’re bringing kids, it’s a good idea to write your cell number and the number of someone not at the protest on their arms, them just in case you get separated. 8. Charge your cell phone and carry a spare battery. Cell service may be limited, but you may want to film the event or take pictures of clever signs. Be sure to ask permission before you take a picture of someone. 9. Wear comfy shoes and clothes. Every protest or rally means a lot of standing! Dress in layers in case the weather changes. 10. Share your experience. One of the best things about activism is that it reminds you that you are not alone. Use the common hashtag of the event/cause and share your photos, video and stories on social media; this has the added bonus of increasing the reach of the protest and encouraging others to get involved. Don’t stop with one event! Continue supporting the causes you care about by consistently sharing your views with your elected officials and congresspersons. Check out Call Your Rep and find out who represents you in congress. Donate money and time to the causes you are standing up for and plan ongoing support and action -- SignUp.com's free volunteer management software lets you coordinate participation in calling campaigns and advocacy days, and even communal potlucks to plan your next event!